Will EUR Get Help from Eurogroup Ecofin Meeting? 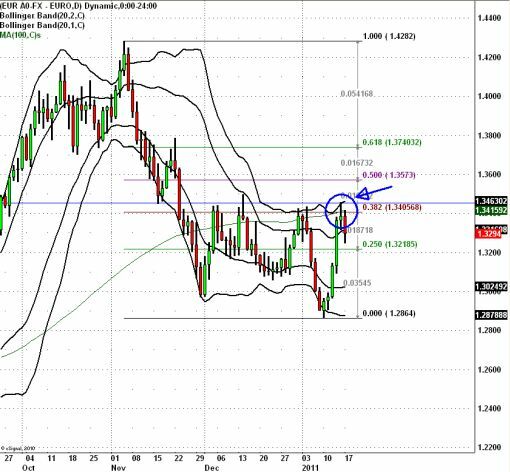 The rally in the EUR/USD has stopped short of a VERY important resistance level. As circled in the chart below, Friday’s high coincided with the 100-day SMA, the 38.2% Fibonacci retracement of the November to January sell-off AND recent highs. Some people may even argue that there is a triple (maybe quadruple?) top forming in the currency pair. From a technical perspective, we are certainly at an important turning point in the currency. Fundamentally, there is also reason to believe that the EUR/USD could slip back towards its 1.30. The Ecofin / Eurogroup meeting is underway and we don’t expect the ministers to reach any agreement. The primary discussion at the two-day meeting in Brussels are potential changes to the European Financial Stability Fund. Initial comments from German Finance Minister Schaeuble have not been helpful as he has indicated his reluctance to support an expansion of the EFSF. An expansion of the EFSF would be positive for the euro because it would increase the bailout fund, making the region better able to handle a bailout of Portugal or Spain. However with Germany opposing the idea and France on the fence, it is very realistic that the ministers and leaders will fail to reach an agreement and no changes will be made to the EFSF. Instead what could come out of the meeting is a list of options to be explored and discussed when the heads of state meet on Feb 4th. The successful bond auctions in Europe last week eliminated the immediate need for action. 4. Increase the scope of purchases. The best option to reassure investors would be to increase the size of the EFSF, but this option is politically unpopular and would probably require new legislation to be passed within the German parliament. The current law limits the guarantees that the German government could provide to the EFSF to EUR123 billion. There are also 2 key elections in Germany in Feb and March which will limit the government’s willingness to make a politically unpopular move. Expanding the scope of the purchases to bonds and/or short term credits is another option that French Finance Minister Lagarde has proposed but this too could require an EU Treaty change. So the most likely option besides doing nothing would be to reduce the interest rate charged on EFSF loans because it would not involve any Treaty changes or new legislation. However reducing the interest rate may not lift the euro much because investors are seeking a “Big Bang” solution and not a band-aid.